When it comes to working capital performance, companies are going nowhere. That’s the headline takeaway from REL’s latest annual survey of working capital performance among 997 large U.S. nonfinancial public companies. In 2013 the three components of working capital — receivables, payables, and inventory — showed scant change from 2012. Overall, average days working capital for the REL 1000 improved by just 0.2 days, or 0.7%, and the three-year improvement in DWC was a mere 0.1%. For many companies, squeezing cash out of working capital no longer carries the urgency it did following the financial crisis. Corporate cash hoards continue to swell, and companies are taking advantage of low interest rates to take on debt and improve their cash flow, says Analisa DeHaro, a director at REL, a working capital consultancy and division of The Hackett Group. “We’re seeing that at both poor and good performers [in working capital management], across the board,” she says. Cash on hand among the REL 1000 rose by 12% in 2013 (although it remained constant as a percentage of revenue, 8%), while free cash flow rose by 23%. Total debt, meanwhile, increased by 8%. Some deterioration in working capital performance was reflected in working capital turnover, a measure of how effectively companies use working capital to generate sales. Compared with 2012, the REL 1000 companies earned 10 cents less revenue per dollar of working capital in 2013. But there are some reasons to cheer, if mutedly. Cash conversion efficiency — a measure of how quickly companies turn sales into cash — improved for the first time since 2010, from 12.74% to 12.87%. Net working capital as a percentage of revenue decreased slightly from 9.4% to 9.3%. And 99 companies sustained improvement in working capital performance in each of the past three years — only 10% of the total, yet up from 81 in 2012 and the highest number since 2009. 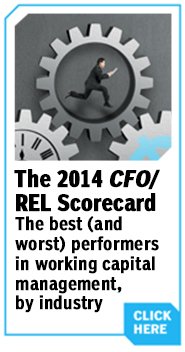 Indeed, there were a number of exceptions to the overall rule of working capital stasis, as seen in the 2014 CFO/REL Working Capital Scorecard, which lists the best and worst performers in 27 industries. Auto component maker Tenneco, for example, slashed DWC by 30%, to 15 days, well below the industry median of 35 days. In the communications equipment industry, Arris Group reduced its DWC by 60%, to 30 days, compared with the industry median of 54 days. Crown Holdings was the top performer in containers and packaging, cutting DWC by 45%, from 25 days to 14. The company’s guidance-beating free cash flow of $645 million for 2013 was due in part to the company’s ongoing effort to reduce working capital, according to CFO Thomas Kelly. “The working capital improvement we have in 2013 is sustainable,” Kelly told analysts in February. 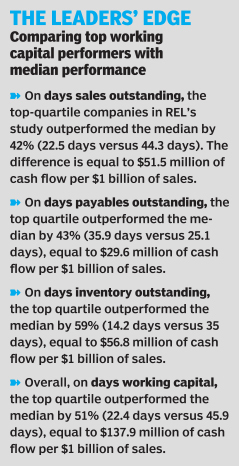 And in household durables, number-two performer Newell Rubbermaid reduced its days working capital last year by 58%. CFO Douglas Martin recently credited improvements in working capital with driving Newell’s 16.5% year-over-year increase in operating cash flow for the fourth quarter of 2013, to $304.2 million. Likewise, some industries did much better than others. Of the 58 industries surveyed in total by REL, wireless telecommunications services, road and rail, and auto components led the way, reducing DWC by 14%, 12%, and 11%, respectively. Generally, the top performers in the REL 1000 — companies in the upper quartile of their industries — “are operating with half the working capital” of companies at the median, says DeHaro. They hold less than half the inventory, collect from customers more than three weeks faster, and pay suppliers just under 11 days slower (see “The Leaders’ Edge,” below). REL calculates that if all companies in the survey operated with the efficiency of the top performers in their industries, they could collectively free up $1 trillion in excess working capital from their balance sheets, or 9% of total company revenues. Inventory accounts for 42% of that trillion dollars, or $423 billion. Days inventory outstanding (DIO) remained more or less unchanged in 2013, at 29.6 days. Since 2008, the opportunity to squeeze cash from inventory has increased by 17%, says REL. Over the past 12 to 18 months, a number of companies have been relocating operations from China, where costs are increasing, to lower-cost Asian countries, notes REL director Craig Bailey. “That leads to inventory buffering,” he says, as companies moving to new countries encounter delays with getting new suppliers up to speed. In some cases, worsening inventory performance can be attributed to industry-specific dynamics. In the tobacco industry, for example, decreasing demand for cigarettes, coupled with the rise of electronic cigarettes, led to a 9% increase in DIO, to 82 days. Overall, excluding professional services, DIO rose in 25 industries, fell in 27 industries, and remained unchanged in 5. REL’s analysis indicates that the 1,000 largest companies could further squeeze $266 billion and $331 billion out of payables and receivables, respectively. Both components of working capital slightly improved in 2013, with DPO improving 2% and DSO less than 1%. Still, companies are paying their suppliers four days sooner than they are collecting from their customers. Companies have become much more sophisticated about managing their payables over the past 10 years or so, says Steiner. Not only do finance managers understand the impact of DPO on working capital, that understanding has “been driven down to the operational level, to where you have an A/P clerk understanding that I need to wait for this payment to go out, because I need to optimize my payment terms,” he says. Similarly, the more that companies remove excess working capital from their processes, the better off they will be—with lower costs, leaner operations, and improved cash flow. Working capital management may not a top priority for many companies at present. But if interest rates go up or the economy goes down, it will be. Edward Teach is editor-in chief at CFO.